Is a German Pinscher Right For Me? German Pinchers are an up and coming breed known for their friendly disposition, intelligence, and energy. German Pinschers are very good family dogs and are gentle with children. German Pinscher puppies are easy to train and quick learners. German Pinschers are very energetic, needing ample daily exercise and open space. Thought to be the descendant of German ratting dogs from the 1400s, the German Pinscher was primarily used to keep farms free of vermin, as well as drive livestock and guard coaches. Although these dogs were first officially classified in 1879, they were often found in the same litter as Coarse-Haired Schnauzers up until the turn of the 20th century. An integral part in the creation of the Doberman and Miniature Pinschers, the German Pinscher didn’t make their way to America until the 1980s, and were not officially recognized by the AKC until 2003. The German Pinscher is a medium sized dog, but every inch of their frame is packed with lean muscle. They have a sturdy, square body, with a straight back, and a short, coarse coat. Their ears are naturally diamond shaped and hang down by the side of their head, but (to maintain the Pinscher image) they are typically cropped into little triangles that stand up atop their head. Like their ears, their tail is normally docked as well. The German Pinscher is a brave, determined, and easily trained breed. They are athletic dogs that have plenty of stamina. This breed has a tendency to become stubborn if not lead by a strong, sure-footed owner. They are not typically good with children and can become outright aggressive with them if not handled well. They are also aggressive with other dogs and are known for being cat chasers. They are a very protective breed, which makes them a great guard dog, but need to be taught not to become overly so, otherwise they may think that they are in charge. The German Pinscher can be seen in a solid hue, from light fawn to a darker, almost reddish, brown. Occasionally they can be a stag red, which is a mix of red and black hairs. Also, they can have the same bi-color pattern as their larger cousin, the Doberman, with a blue or black coat with tan markings. 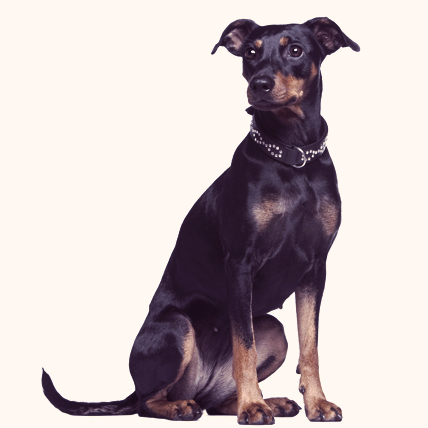 The German Pinscher is generally a healthy breed without common health concerns.